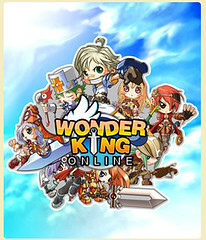 WonderKing is a free-to-play fantasy MMORPG from NDoors Corporation. The playable characters have many similarities to those in Atlantica Online, also an NDoors fantasy MMORPG, but the fantasy artwork here is very cartoony. Our WonderKing fantasy game art galleries include media from the North American site as well as international sites. This page has a site map to all our WonderKing galleries, a playlist of various trailers and movies online, and game world background information from the official site. Convinced that serving God only imprisoned and robbed him of his free will, Baalon broke loose from the heavens to claim his independence from his creator. Believing that human beings were nothing more than inherently inferior creatures controlled by their sinful desires, Baalon sought revenge by plotting to enslave all of humanity, God's most precious creation. In order to execute his sinister task, Baalon created the Gate Stone which granted him the ability to enter different worlds, leaving the human world defensless and vulnerable. Immediately, Baalon set his sights on wreaking havoc and destruction on the inhabitants there, enveloping the Esior Continent into unrelenting tragedy. The realm of Hades, unable to care for the growing swarm of deceased spirits clamoring for eternal rest, was desperate to end this bitter massacre. In order to restore order back to the human world, they sent a mercenary troop comprised of their best warriors called Zero Force to wage war against the Sinistry of Devils of Demon King Baalon. Although they fought valiantly, Zero Force was lamentably defeated and Esior fell into the hands of the Sinistry of Devils. With no one left to oppose them, the Sinistry of Devils easily infiltrated and seized control of the human world. Although the number of the Sinistry of Devils was few, they cruelly exercised their supremacy deep within the cities of countries, transforming treacherous traitors into their loyal subjects and brave generals to insignificant beggars. Gripped by the wickedness of the Sinistry of Devils and plagued by the recent attacks of monstrous creatures, humanity found no relief in sight and suffered in endless turmoil. "The Holy King will rise from a desolate island to cleanse the blood of the filthy and erase the dark shadow that looms over all humanity." According to the prophecy, anyone who wishes to be saved from this torturous hell must await the arrival of the Holy King who will purify the putrid blood of the Sinistry of Devils. That will be the WonderKing, who will save the world from darkness. As an epic 2D Side Scrolling MMORPG, WonderKing boasts delightfully animated graphics and compelling features for users of all ages to enjoy. A captivating story of heroism along with a fantasy mission system is the foundation and forte of WonderKing. Rise to the pantheon of legendary craftsmen by utilizing the intriguing crafting system! 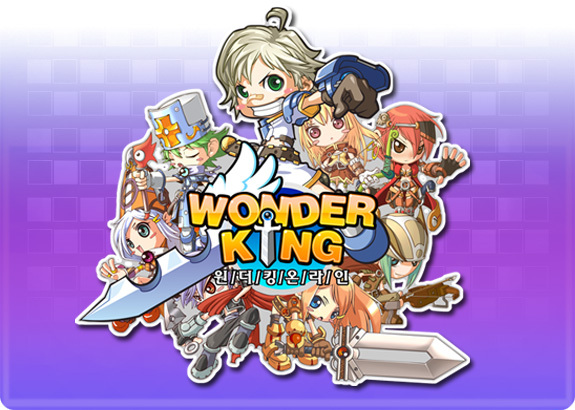 Lead a fabled league of ancient heroes and become the greatest guild leader that ever stepped foot in WonderKing! Create delectable dishes with the convenient cooking system! Engage in spectacular battles with the help of pets which become both dependable and courageous comrades! Experience an innovative customizable hometown system! Declare yourself king after conquering your enemy's fortress in a dynamic castle battle! We cordially invite you to immerse yourself in WonderKing and enjoy both a variety of entertaining features combined with fluidly smooth controls. Come and join us in our epic world!